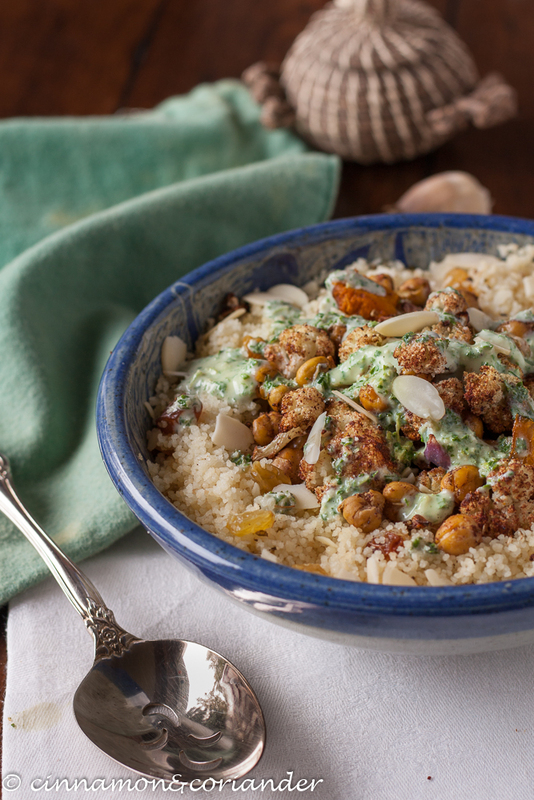 Fans of Middle Eastern Cuisine will love this healthy vegan couscous bowl. 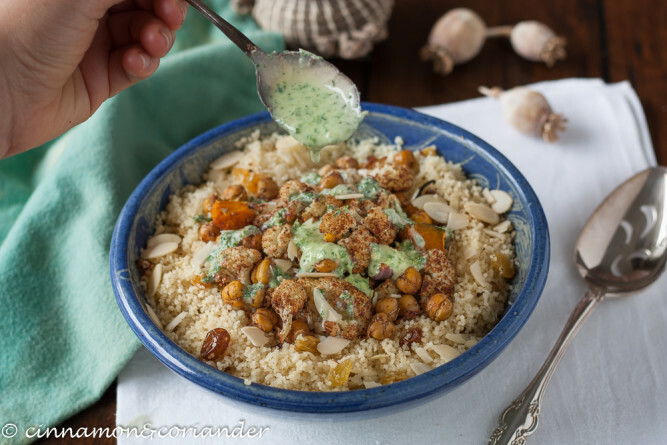 Fluffy Orange-Almond Couscous topped with oven baked, Za’atar spiced chickpeas, squash, and cauliflower florets – served with a creamy Tahini Mint Sauce. *Amazon disclaimer: A note about affiliate links in this post: some of these links will take you to Amazon where I may receive a small percentage of sales, at no extra cost to you. This Vegan Couscous Bowl with Roasted Chickpeas, Cauliflower & Mint Tahini Sauce is packed with healthy ingredients! after dinner and drinking hot beverages throughout the day. I am fully willing to say goodbye to summer for a bit, here. Last Sunday, I could actually even convince my husband to take a long, scenic walk along the South Saskatchewan River with me and it was magical! He also got to watch me eat a crabapple, which reconfirmed his theory that my love for sour fruits is not quite normal. That day we got home, craving something comforting and vegetable-driven. Something that would not undo all the benefits of our walk. I created this couscous bowl more or less from what was left in the fridge after a week of pretty healthy eating. Just some cauliflower and onions, a quarter kabocha squash and a can of chickpeas! I did some browsing online and found a recipe over at Oh My Veggies, which I adapted to create this fall-inspired vegan couscous bowl. What I love about this easy vegan recipe, is all the different textures and flavors that take this simple dish from good to awesome. 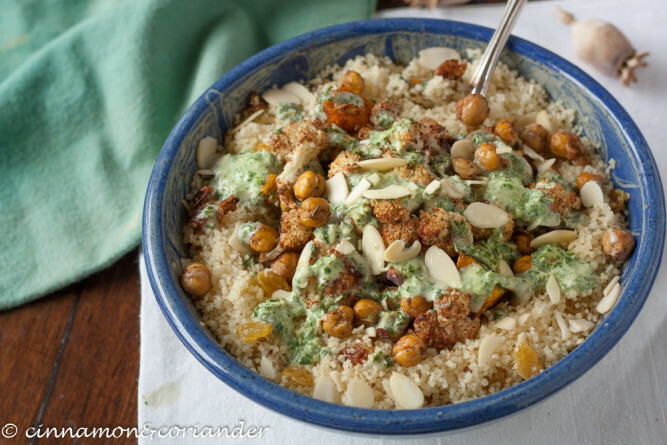 the crunchy, nutty chickpeas along with some toasted almonds. I also added a handful of plump golden raisins to my orange couscous bowl for some extra chew and sweetness. The Tahini Mint Sauce adds a refreshing element and goes so well with the whole Middle Eastern theme of this meatless dish. The spices we use to marinate the veggies are essential. We are using primarily za’atar to flavor the veggie mix. Don’t panic if you have never heard of it. We will sort this out right away. This Middle Eastern blend of thyme, oregano, marjoram, sesame seeds, sumac, and salt is indeed a great addition to your pantry. 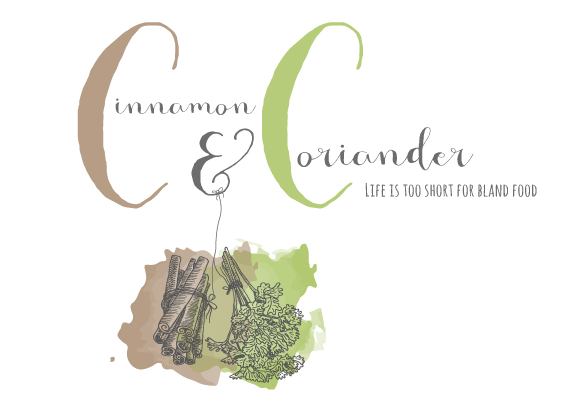 , or you can simply make your own blend following this recipe. I use it to marinate tofu or for my Za’atar Bread Rolls. It will rock your world, so do not hesitate to mix a bigger batch. Sumac is another exotic ingredient on the recipe list. It is a dark red spice with a tangy, lemony flavor, which is used in a lot of Middle Eastern and Mediterranean recipes. From dry rubs or marinades, to dressing. * online. You could substitute with paprika powder mixed with a quarter teaspoon of lemon zest, but it will not be quite the same. I am sure you are going to love this healthy, nourishing couscous bowl. It is so easy to prepare and does not require any special kitchen skills. Have it for dinner and take the leftovers as a packed lunch to the office! Leftover sauce keeps for about 4 days when stored in the fridge. 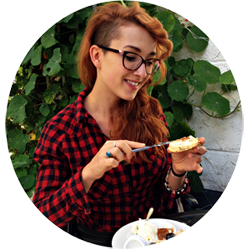 ★ Did you make and love this vegan couscous bowl recipe? Give it your review below! And make sure to share your creations by tagging me on Instagram! 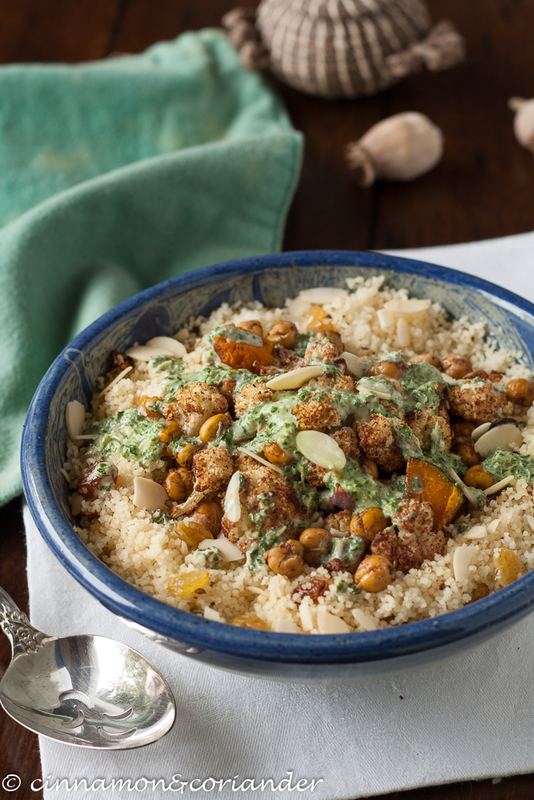 Fans of Middle Eastern Cuisine will love this healthy vegan couscous bowl. Fluffy Orange Almond Couscous topped with oven baked Za'atar spiced chickpeas, squash, and cauliflower - served with a creamy Tahini Mint Sauce. Break the cauliflower into little florets. Drain chickpeas. Peel the onion and cut it into slices. Cut squash into cubes. In a large freezer bag, toss vegetables with za'atar, sumac, cinnamon, cumin and 3/4 to 1 tsp of salt as well as the broth and olive oil and let marinate in the fridge for about 4 hours or overnight. Preheat the oven to 400 Degrees. Transfer the veggie mix including liquid to a baking dish and let bake for 45 minutes, stirring once after 20 minutes. In the meantime, mix orange juice, 100 ml of water and 1/2 tsp of salt in a small pot and bring the mixture to a boil. Take the pot off the heat and stir in the couscous. Put the lid on the pot and let stand for 10 minutes. On medium heat, toast the almonds in a pan without fat, until just golden. Peel the garlic, chop the mint coarsely and juice the lemon. Blend all the ingredients for the Sauce in a food processor until you have a creamy, green sauce. Season with more salt and pepper to taste. Fluff up the couscous with a fork, making sure to break up all the chunks that might have formed. Stir the almonds and raisins into the couscous and divide couscous between 2 serving bowls. Top with half of the veggie mix and drizzle with tahini mint sauce.Enjoy! Like my recipe for Vegan Orange-Almond Couscous with Roasted Za’atar Vegetables and Tahini Mint Sauce? Pin it! Also eigentlich trauere ich dem Sommer ja schon hinterher. Zumal ich gerade hier mit Decke und Wärmflasche sitze und es draußen kübelt was runter geht. Aber auf der anderen Seite sehe ich dann so köstliche Rezeptideen aus der Herbstküche wie diese vegane Couscous Bowl und mir geht das Herz auf. Wunderbar! Die sieht einfach nur toll aus. Du hast nicht zufällig noch eine Portion über, die ich mir nehmen könnte? Ach, das freut mich, wenn ich mit meinem Rezept ein kleines Gewicht mehr zugunsten des Jahreszeitenwechsels mit in die Waagschale werfen kann. Übrig haben wir leider nichts mehr, aber vielleicht packt dich ja mal die Lust zum Nachkochen! Das schmeckt auch ganz herrlich auf der Couch mit Decke und Wärmflasche..besonders wenn es draußen kübelt! 🙂 Ich grüße dich ganz lieb. What a delicious and healthy looking meal! Couscous is such a great alternative to pastas or potatoes, and I just love these crispy chickpeas on top! Thanks so much Anna! Oh yes, those chickpeas are KEY! I love love Middle eastern dishes and this looks fantastic. I love all the flavors from zaatar and sumac. It’s a flavorful nutritious bowl. Thanks so much! All those spices turn this simple dish into a real flavor bomb! happy you like it! Totally in love with the flavors in this bowl! What a hearty and tasty meal idea! I love all of the flavors going on in this dish, it looks delicious! This is right up my street! 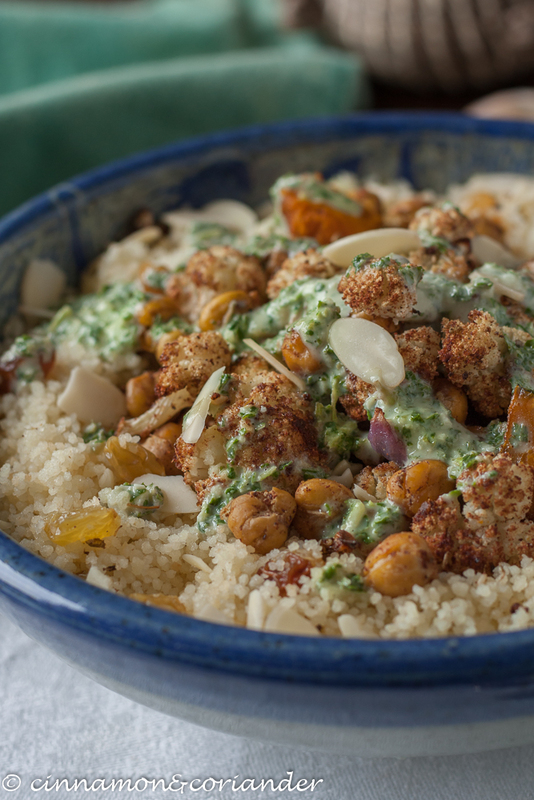 I love all the spices in this and that orange-scented couscous sounds perfect with the spices. I actually bought couscous a while back, but didn’t know what to do with it! This looks like the perfect solution! I would love this for lunch or a nice, light dinner. The sauce on top finishes it off perfectly. I’m all about beautiful bowls of nutrient-dense food right now, so this one is speaking my language. I’m in love with this. Pinning for later! Thanks so much, Krista! Happy you like it! This looks divine! I can so see myself eating this for lunch! Love the authentic aspect of this dish! I’ll be making this one for sure! I love the orange notes in this and I bet the cinnamon elevates everything. The tahini mint sauce might be my favorite part of the whole dish though. I’d like to drizzle that on everything. This looks amazingly healthy and delicious. I love the flavors you have combined into this dish. Can’t wait to make it.